Around a year ago I purchased a Julius Pettersson Knife from you. What a fantastic blade. As a chef I use quality carbon steel knives every day, and this is certainly a great blade. I waited so long to find the right materials in which to make the handle. I was able to obtain from a friend a nice burl piece of Tasmanian myrtle beech wood for the handle, along with pieces of fake ivory for the ends and spacers. Rasping and sanding this timber was a mission and a half – it’s incredibly hard. A little scrimshaw compass and a coat of linseed and shellack to finish. The sheath is a stitchless scandi design. This has definitely been a great project to work on and I would recommend it to anyone with or without prior wood working skills. Thanks again Woodlore and Julius Petterson for your great knife. This entry was posted in Bushcraft Clothing & Equipment, Customer Posts on August 23, 2012 by Woodlore Team. Hi Chris, brilliant craftsmanship, superb knife and sheath, love the scrimshaw. you certainly have given me inspiration, thank you. The knife is great Chris but I particularly like the ‘stitchless’ sheath. 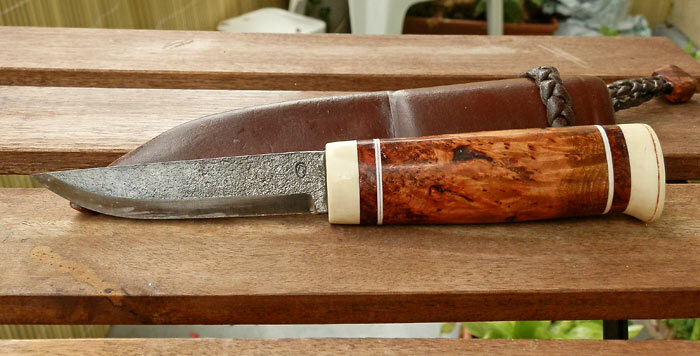 As a maker of the more traditional stitched knife sheaths I am intrigued – going to look into this some more I think. It does rather look as though a bit of practice will be required! There are a few websites that can direct you, just try stichless scandi sheath. Practice on a section of spare leather. Took me four attempts to get it right as a little difference in size will make a sheath to small or large. Mark out the leather of the knife you intend to use. Good Luck. Labour well spent, Chris! What a beautiful piece you have created. The scrimshaw compass is wonderful – function meets art! Just perfect. 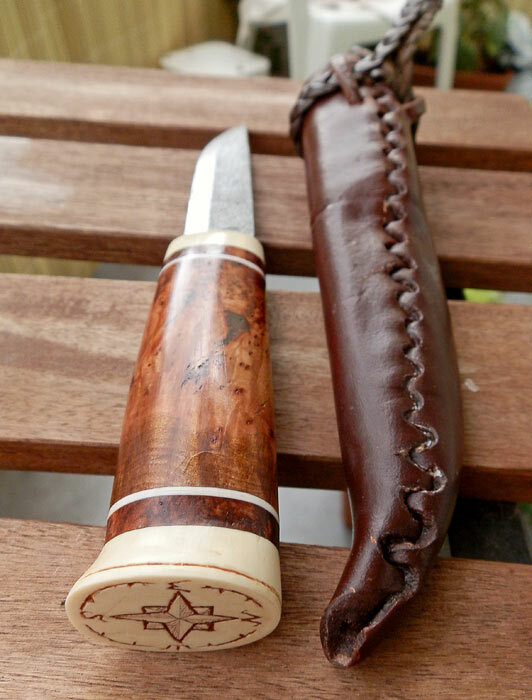 Fantastic sheath as well…so curious – how did you do it? You’ve inspired me to give this a try!